For a long time I had a problem with this city even though, on the face of it, it is one of the most attractive places in America, if not in the world. But my visits here were always somehow spoiled. The first one was in 2001. It was at the end of a long, trans-continental drive and we only had a few hours before we had to start our journey back to Florida. I did enjoy it but it was hectic and we were overwhelmed by so many sites on that crazy trip that it was hard to properly appreciate the city. You can read more about that visit here. 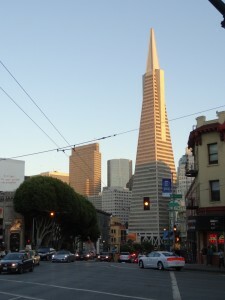 Next time I travelled to San Fran was in 2004 when with my mates we were driving along the Pacific Coast. This visit was even shorter than the first one, literally just an overnight stop in a dingy hostel in the downtown before heading out further north. Nothing to write about. 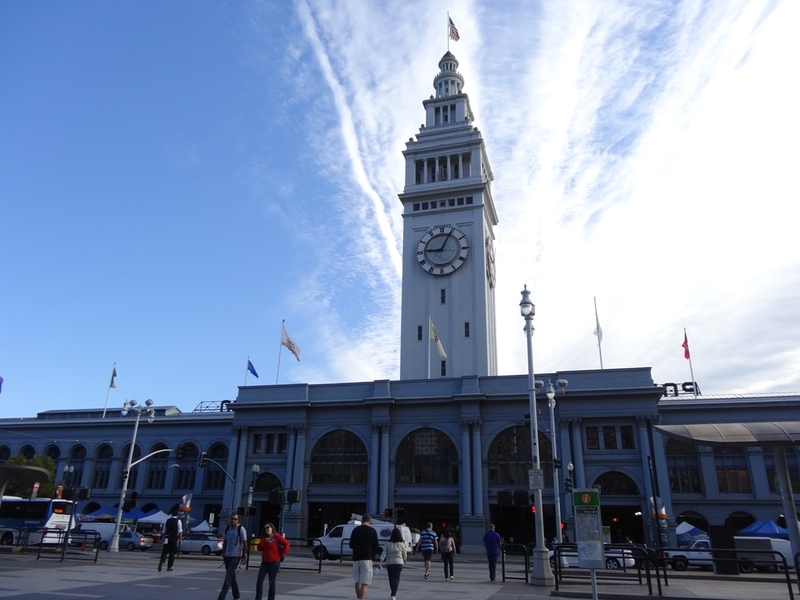 The third time I arrived in the Bay Area it was in 2009 during my long trip around the national parks of the American West. It was a glorious Saturday in June, I had three more days before my return flight to London and I was full of excitement. However, ludicrous crowds of tourists around Embarcadero and in the neighbouring areas quickly annoyed me enough to send me driving into the deserts. I stayed in the city less than 3 hours. Finally in 2013 came my, so far, most fulfilling visit to the Bay Area. For a start we decided to fly to San Francisco directly, rather than arrive at the end of a long drive from somewhere else. 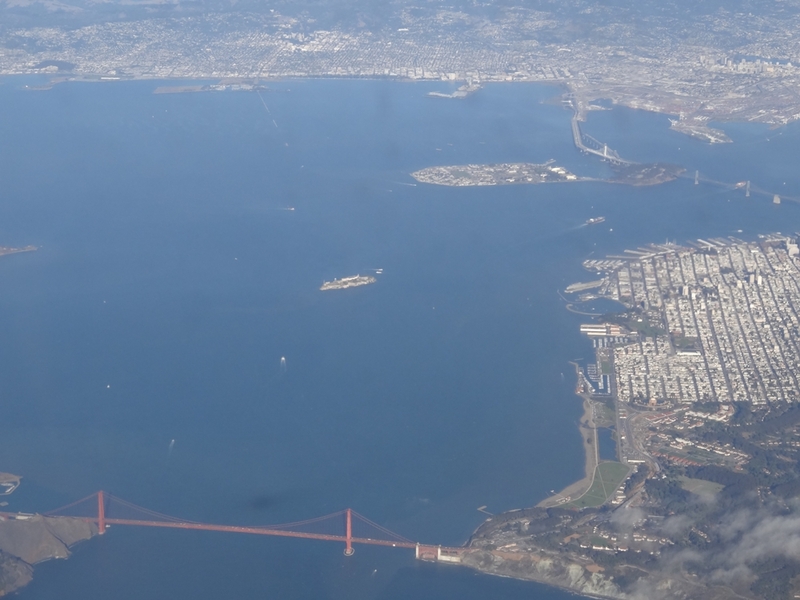 Flying to SFO offered us a fantastic aerial view of the Golden Gate Bridge, the Bay Bridge and the downtown. From the plane window we could fully appreciate the city’s fantastic location. This time we also carefully selected our accommodation. We didn’t want noisy hostels in downtown or motels in some distant suburbs from where you have to drive for hours but we didn’t want to spend on expensive hotels either. 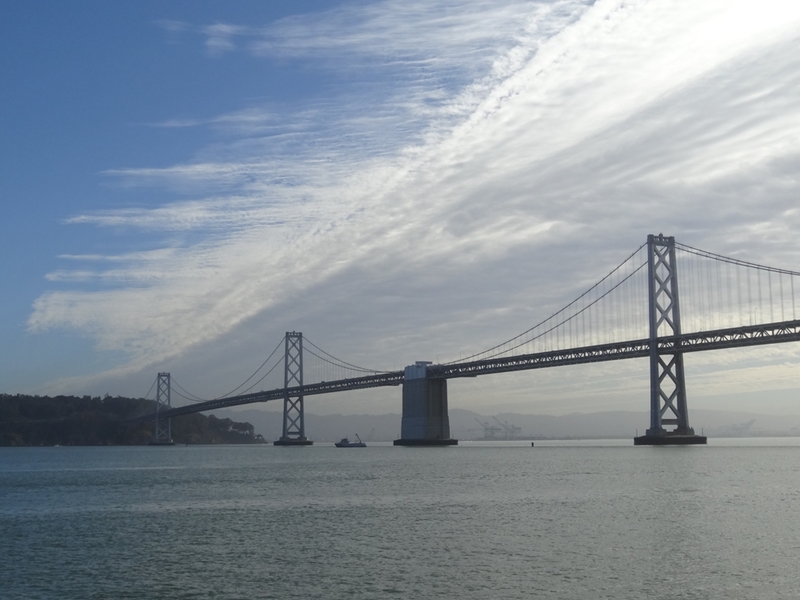 Of course San Francisco is a rather expensive place to stay but we got round it by booking a hotel in Berkeley on the eastern shore of San Francisco Bay. This pleasant city is dominated by the oldest campus in the University of California system which gives it a very nice vibe. Most importantly, it only takes 22 minutes on the fast BART train to reach the Embarcadero station in San Francisco, way less than my daily London commute. All that meant that we could leave our Camaro at the hotel and head straight into town with ease. We started our tour from the San Francisco Ferry Building. Built in Beaux Art style it was finished in 1898 and its 245-foot clock tower was designed after the Giralda bell tower in Seville. It is a very impressive structure indeed. A few ferries still use it as a terminal but most of the building is nowadays converted to shops and offices. Still, I could easily imagine it being busy with thousands of ferry passengers which disembarked here daily before the Bay Bridge was built. From the neighbouring wharves we could admire the impressive span of the Bay Bridge itself. It is a fantastic bridge, if you ask me, and one of my favourites. It looked absolutely stunning in the early morning sunshine with some lingering fog and mist. 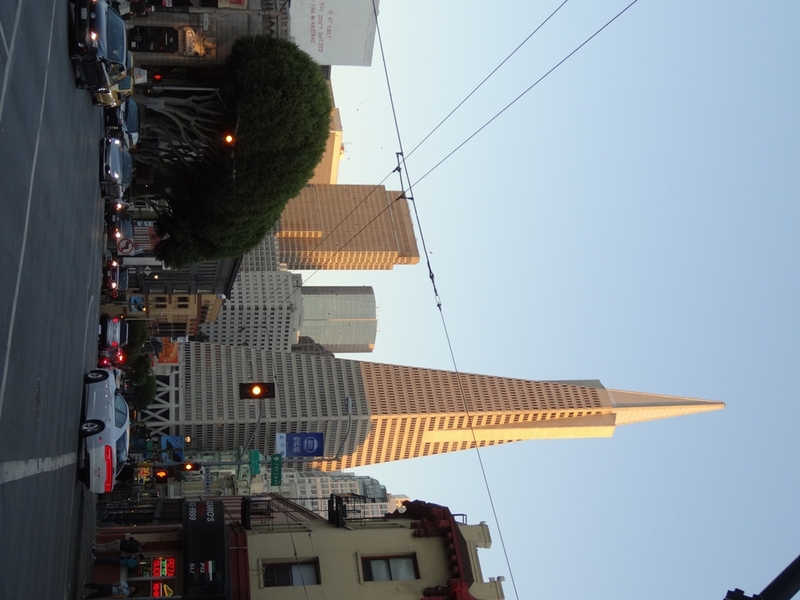 From the ferry building we walked through the Financial District admiring its varied architecture (including the iconic Transamerica Pyramid) heading towards the Telegraph Hill and a site which I always wanted to see but somehow never managed to during my previous trips, the Coit Tower. Built in 1933 it is a 64-meters tall Art Deco structure made of unpainted reinforced concrete. Inside, at the base, there is a small exhibition and a gift shop but the most interesting aspects of the interior are the murals. They showcase some strong leftist and Marxist ideas and depict life in California during the Depression. Workers of all races are shown as equals, often in the heroic poses of socialist realism. Coming from Eastern Europe I always find this sort of art particularly fascinating. In the 1930s art in America had some elements really resembling the socialist art of Soviet Union. 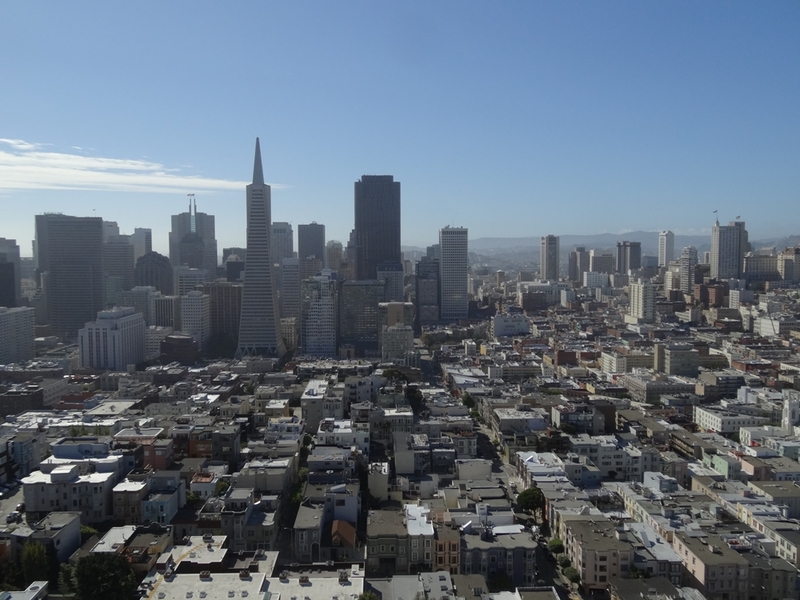 But what is best about the Coit Tower is the views from the top. Being located on a tall hill the monument offers a much better panorama than its modest height would suggest. 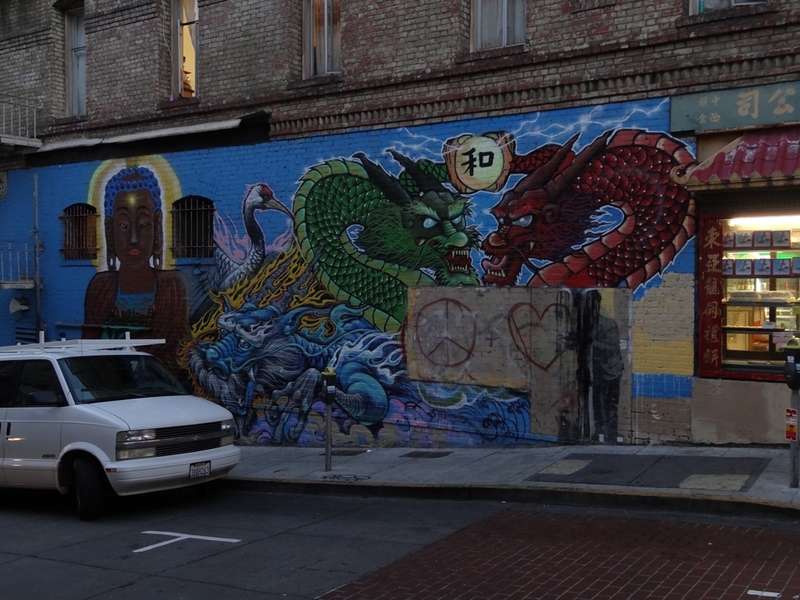 Some of the sites visible include the Golden Gate Bridge, Alcatraz Island, the Bay Bridge as well as most of the densely built-up downtown San Francisco, including the Chinatown, Financial District and North Beach neighbourhoods. After coming down we headed to North Beach. I was trying to find a small map shop which I visited during my first trip in 2001. After asking in a few places we learned that the shop shut a few years back. Pity. Now, as we were in the historic heart of the city’s Italian community, we treated ourselves to a tasty pizza in one of the local restaurants. Our next attraction involved catching a ride onboard one of the historic cable cars. 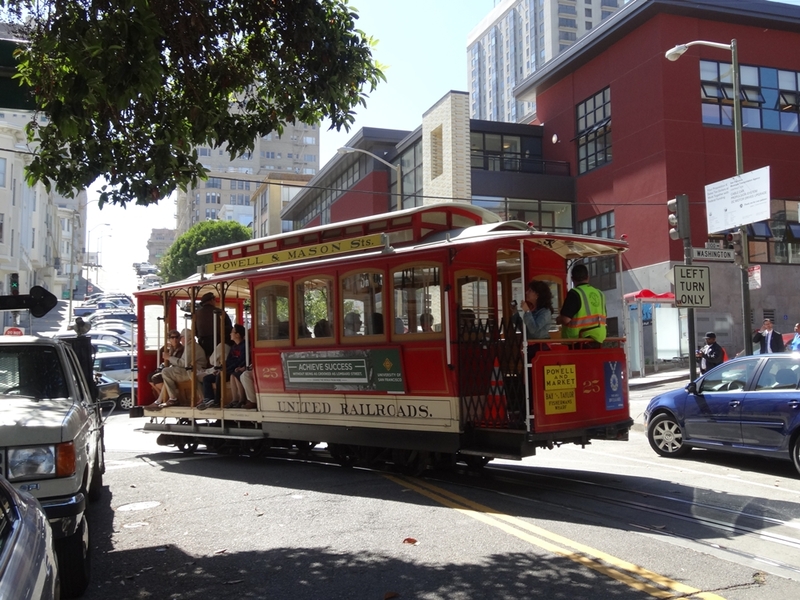 First we walked to the Cable Car Museum in Nob Hill. What is unique about the place is the fact that it is not only a museum but also a working cable power house that powers the cables running under the streets of San Francisco which still pull the famous trams. 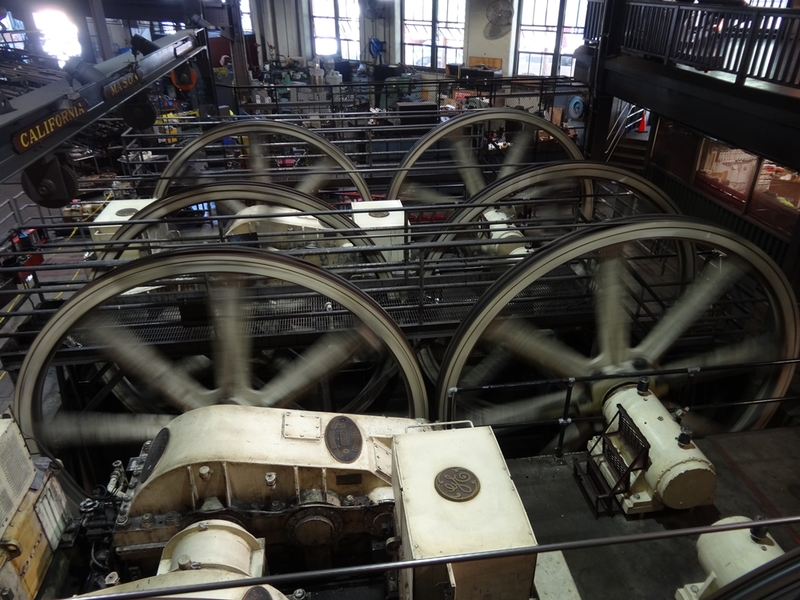 Visitors are able to view the working heart of the power house from an overlooking gallery as well as descend below the junction of Washington and Mason streets in order to view the large cavern where the haulage cables are routed via large sheaves out to the street. I found it an absolutely fascinating place, a living and working piece of history. From the museum we caught one of the trams running towards the waterfront. It was a fun ride as the tram was quite full and we had to stay on the steps outside holding fast as the tram hurtled down the hill towards the bay. The Fisherman’s Wharf area was packed with tourists, so we headed west along the coast. Our first stop was a bit inland, the Place of Fine Arts, and it was well worth crossing the busy road to get to it. The monumental structure was built for the 1915 Panama-Pacific Exposition and is one of its only few survivors. It avoided demolition after the exposition but it was not build from durable materials (it was effectively made of wood and plaster) and it was collapsing by the 1950s. It was finally rebuilt of steel and reinforced concrete in the 1960s. 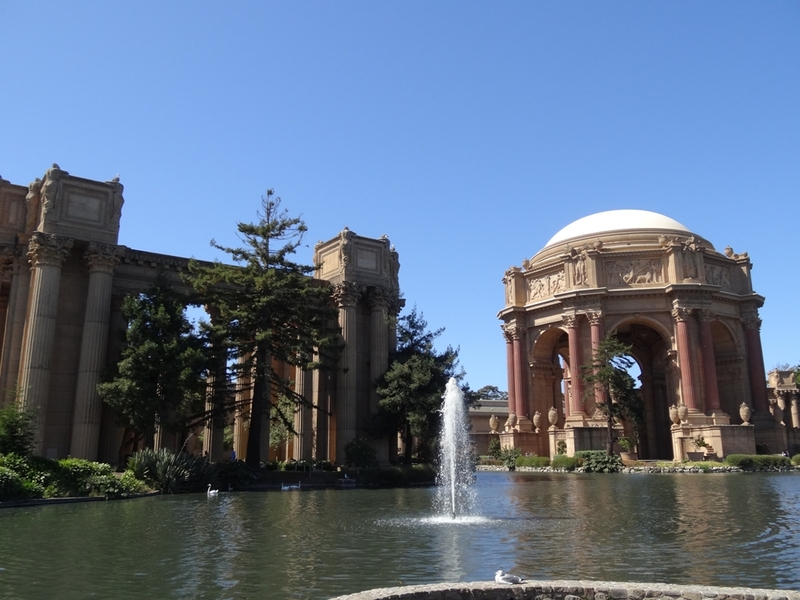 Built around a small artificial lagoon, the Palace of Fine Arts consists of a wide pergola around a central rotunda and resembles giant ruins of some ancient Roman or Greek temples with all the columns and “classical looking”sculptures. It is an absolutely stunning and photogenic site. No surprise that it is very popular as a setting for photo shoots and weddings. The weather was fantastic so we decided to walk all the way to the Golden Gate. The coastal path is part of the Golden Gate National Recreation Area and it is a really pleasant trail. Finally, over 8km from the Ferry Building, we reached our furthest destination that day, the Fort Point National Historic Site. There was a fort in the narrowest point of the Golden Gate since 1794 when the Spanish built a castillo. However the bulk of the current structure comes from the second half of the 19th century when the US Army built a new fort. 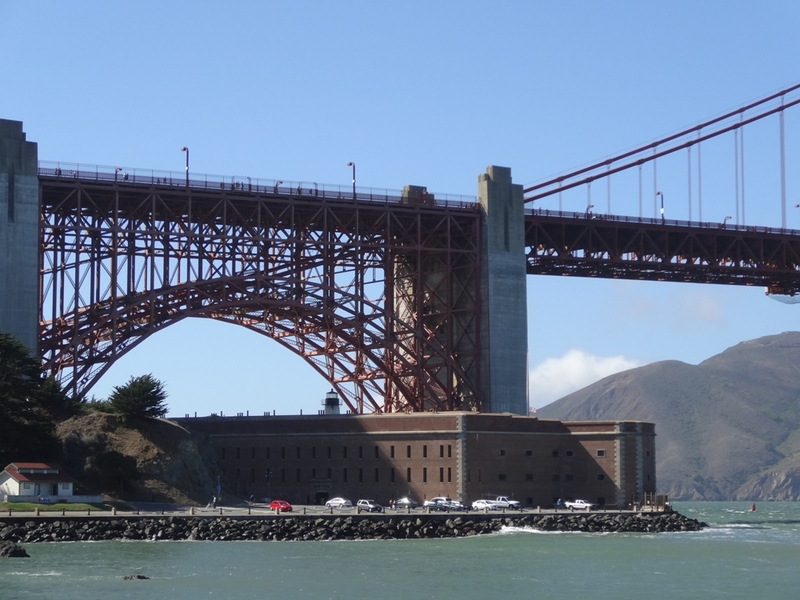 What makes it a really spectacular place is the location: directly underneath the approaches to the Golden Gate Bridge. In fact the fort faced destruction at the time of the construction of the bridge but chief engineer Joseph Strauss redesigned the bridge to save the fortress. The end result is rather stunning. I love the juxtaposition of the 19th century brick and stone buildings of the fort dwarfed by the 20th century steel structure of the bridge. The Golden Gate Bridge is another of my favourite bridges and it was great fun to be able to admire it from this unique perspective. After driving across it some years ago, and later viewing it from the nearby hills, this time I had a chance to examine its elaborate underside. From the Fort Point we headed back to downtown, stopping for a beer in some nice bar before finally reaching San Francisco’s colourful Chinatown after dark. I visited it during my first trip to the city and ever since then this one neighbourhood is one of my favourite parts of it. We decided to finish our day by enjoying some tasty Chinese food in one of the affordable local restaurants. The food was great and the views from the window even better. That was the last point of our one-day visit to San Fran and, as I mentioned already, it was my most enjoyable one so far. Hard to clearly explain why but it probably helped that this time I knew what I wanted to see (and managed to do it) and also wasn’t distracted by the usual first impression awe and confusion. I guess that is the advantage of repeat visits, especially to big cities. I had a similar experience with New York City. My second visit there was more fulfilling than the first one. I’m not saying that I don’t enjoy visiting new places but returning to some destinations simply offers a different, more insightful, perspective. So, where should I go back to next? Seattle? Portland? Chicago? Or maybe Detroit? This entry was posted in Uncategorized and tagged Bay Area, Cable Car Museum, Coit Tower, Fort Point National Historic Site, Golden Gate, Place of Fine Arts, San Francisco, San Francisco Ferry Building, Transamerica Pyramid on March 9, 2015 by admin. 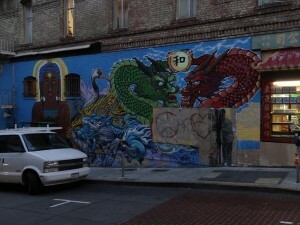 Hi Gregor, great post, it really brought back my own memories of San Fran. 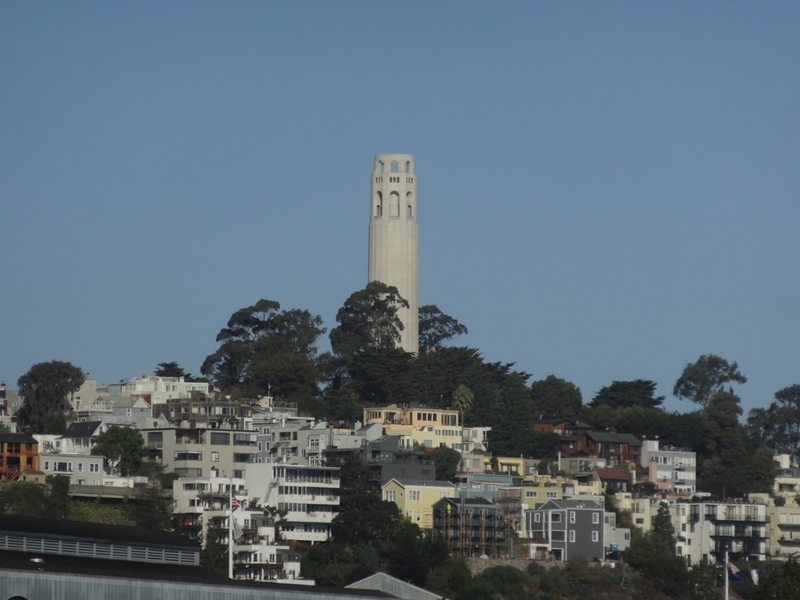 Coit Tower, and especially being stuck in the cable car (we had to be rescued by a heavy truck) were my highlights. Good luck with your new blogging adventure! I actually started the blog a couple of years ago. I’m just not good at publicizing it. Ha, silly me, I should have notice all the previous entries on the side. 🙂 Anyway I suggest you should go back to Detroit.